George Stephanopoulos examines the fallout from Baltimore, Sunday on "This Week"
ANNOUNCER: This Week, bombshell arrests, explosive nationwide reaction to those six officers charged in Baltimore. The very latest on the massive marches. Ready for Hillary: he's a folk singing socialist, Bernie Sanders is ready to shake up the Democratic primary. He's here live. Christie's comeback? New Bridgegate indictments. Can the New Jersey governor now put the scandal behind him? Fight of the century, a $300 million purse. But after last night's bout, is the sport of boxing still standing? GEORGE STEPHANOPOULOS, HOST: And we begin in Baltimore. That is a live shot of city hall right now. Sunny and calm ahead of more rallies today. The Maryland governor calling for a day of prayer and peace after a tumultuous week, those riots on Monday. A mother showing her son some very tough love. That surreal scene at Camden Yards Wednesday, Orioles playing the White Sox not a single fan in the stands. And on Friday, state attorney Marilyn Mosby surprisingly swift bombshell, six officers charged for the death of Freddie Gray sparking a national conversation on crime, policing, poverty and race. We're covering all the angles this week. And we begin in Baltimore with ABC's Jim Avila. Good morning, Jim. JIM AVILA, ABC NEWS CORRESPONDENT: Good morning, George. The protests and marches continue here, some of them large in size, but mostly peaceful. The real trouble coming mostly at night at curfew time. AVILA: Overnight, a curfew still in effect, more protests and Baltimore's police commissioner saying he'll wait for the investigation to proceed. ANTHONY BATTS, BALTIMORE POLICE COMMISSIONER: And now we'll have the confidence that the truth will come out and the truth will overcome for all. AVILA: All of it sparked when Baltimore stunned itself and the nation, its youngest chief prosecutor in the country, 35-year-old Marilyn Mosby, announced that she wants to put six of her police officers in prison for killing a poor black man. MARILYN MOSBY, STATE ATTORNEY: To the people of Baltimore and the demonstrators across America, I heard your call for no justice, no peace. UNIDENTIFIED MALE: This is what democracy looks like. AVILA: ...is today patting itself on the back for standing up to what many see as an epidemic of police brutality. UNIDENTIFIED MALE: To the naysayers who say what is marching going to do? Marching got us to this point. AVILA: The six officers, three white and three black, accused of loading Freddie Gray cuffed and shackled, face down into a police fan, leading to his death, following an illegal arrest, are free on bail and will appear in court on May 27. Their police union says they did no wrong and accused the state's attorney of a political prosecution designed to quell the unrest rather than seek justice. UNIDENTIFIED MALE: We are disappointed in the apparent rush to judgment given the fact the investigation into this matter has not been concluded. MOSBY: My job as the prosecutor is to follow and uphold the law, and that means equally applying justice to those with or without a badge. AVILA: There's another protest scheduled for this afternoon. Baltimore authorities are reluctant to lift the curfew until they're absolutely sure the city is safe and secure. Until then, the national guard will remain on post and the state of emergency remains in effect -- George. STEPHANOPOULOS: OK, Jim, thanks very much. Our next guest has been marching in Baltimore streets all week long. There's Congressman Elijah Cummings on Thursday night. His West Baltimore district ground zero for this crisis. He joins us now from city hall. Congressman Cummings, thank you much -- thank you so much for joining us this morning. How did Baltimore come out this week? REP. ELIJAH CUMMINGS, (D) MARYLAND: I think we did pretty good. It was a very unfortunate incident with Freddie Gray, a young man who died a very tragic death. But as far as Baltimore is concerned, I thought initially we had a lot of problems on Monday, but I think overall it's been a lot of peaceful protests and that's a good thing. STEPHANOPOULOS: As you know, those six officers are vowing to fight the charges. We just saw the head of the police union call it a rush to judgment. Are you confident these charges are going to lead to convictions? And will we see new unrest if they don't? CUMMINGS: Well, I don't -- I feel very comfortable with regard to what Mr. Mosby has done. She is a veteran prosecutor. She's a young lady who is -- spent a lot of time addressing these kinds of issues. And she is -- her integrity is impeccable without a doubt. And I think she made the very best decision that she could. She looked at all the evidence and did what she had to do. STEPHANOPOULOS: What has to happen in the meantime? You said more than 80 members of congress have come to you saying they're worried their city is next. What can you do to prevent that? CUMMINGS: Well, one of the things we've got to do, George, is we've got to invest in our cities and our children. A lot of young people feel that they have been disconnected. And we have to have what I call an inclusion revolution and address issues such as joblessness and training for young people. And we also have to look at our police department very carefully. We need to have an up and down look at it. And address it and be honest and address it in an effective way. STEPHANOPOULOS: Finally, sir, a lot of us were struck by the cover of TIME magazine this week. It showed the city of Baltimore striking out American 1968 to 2015. A lot of people say Baltimore never recovered from those riots in 1968. What is it going to take to recover this time? CUMMINGS: Well, it's going to take all of us. It's going to take everybody from the president, the governor, all of our state legislators and certainly we're going to have the business community and foundations. George, I can tell you people are already rallying trying to address these problems. And then again we're going to have to go back and make sure that we listen to our children. I feel their pain. Just the other day, a young man told me he said, Mr. Cummings, I feel like I'm in my coffin trying to claw out of it. And that's not the way that we want our children to feel. STEPHANOPOULOS: Boy, that is for sure. Thank you, congressman. Thanks very much for joining us this morning. The death of Freddie Gray, the latest example of what President Obama called America's slow rolling crisis in the way police engage African Americans. Pierre Thomas went on the beat with Washington, D.C. police to examine what's happening now and what needs to change. PIERRE THOMAS, ABC NEWS CORRESPONDENT: The searing images -- Ferguson, a 12 year old boy shot and killed by police in Cleveland, Eric Garner's death in Staten Island, and that fatal police shooting of Walter Scott in South Carolina, and now Baltimore. A steady stream of events stocking a growing national movement and intense debate about race and policing. With each case, the intensity grows and the unsettling truth is that a toxic cocktail of factors that led to unrest in Baltimore exists in cities across the country -- high unemployment, high poverty, high rates of crime and incarceration, and deep-seated mistrust between minorities and the police that serve them. What it means is that all it takes is one controversial encounter between a police officer and an African American male to spark a firestorm of emotion and accusations. UNIDENTIFIED MALE: I think it's a seminal moment in policing. I think we're seeing a paradigm shift. UNIDENTIFIED MALE: It's going to take a long time for us to rebuild from the distrust that's going on right now. UNIDENTIFIED MALE: People are thinking that's what we do right away, reach for our guns and start shooting people when that's not the fact at all. UNIDENTIFIED MALE: The citizens are focusing too much on the negative, which is a very, very small minority. Every day, there's millions of encounters between police and citizens that go very well. THOMAS: We spent time with officers in Washington, 40 miles from Baltimore, they say some of the issues between minorities and police run deep. UNIDENTIFIED MALE: The police department is getting blamed for the historic lens through which black people view government in general, police in particular. THOMAS: And today because police are often most aggressive in high crime neighborhoods, the mistrust builds. UNIDENTIFIED MALE: They're not seeing us as normal human beings and are just like them, but have a really tough job to do. THOMAS: Right now authorities say that better technology, including expanded use of body cameras by police and improved training of law enforcement on use of force are keys to reducing encounters that end badly. UNIDENTIFIED MALE: On both sides, we need to listen to each other. UNIDENTIFIED MALE: Get out of the car, interact with the citizens, let them interact with you. STEPHANOPOULOS: And Pierre Thomas joins us now. He's here along with Dan Abrams, our legal analyst and the former New York City police commissioner Ray Kelly. Welcome to all of you. And Dan, let me begin with you. These six charges came a lot faster than people expected on Friday. And more often than not, these police brutality cases end in acquittals. DAN ABRAMS, ABC NEWS LEGAL ANALYST: Yeah. And I think that they're going to have some real issues here with some of the charges, meaning you have to look at each officer's actions separately. You can't say there are six officers. We're going to review all six cases together. For example, I think that there's been some overreaching on the part of the prosecutor based on the facts as she laid them out with regard to two of the officers charged with manslaughter. Why? Because they arrive on the scene later and don't do enough. That's going to be a tough conviction for manslaughter. The second degree murder charge for the driver also going to be tough. STEPHANOPOULOS: Let me stop you there, because this is a pretty serious charge, Caesar Goodson, the most serious charge, second degree depraved heart murder. What does that mean? ABRAMS: In effect, it means we think that he's more culpable. He was more indifferent. He took action and didn't care at all. And so there's no sort of firm legal line where you cross from manslaughter to depraved murder. Neither one requires specific intent; it just says we think this one is so much worse. And the reason I think the prosecutor thinks this one is worse is because he had opportunity after opportunity with each stop to end this. STEPHANOPOULOS: Here's the one I don't understand. I understand perhaps false imprisonment for those two arresting officers. ABRAMS: Well, look, I would argue that I think that the initial officers -- if they falsely arrested -- if they had no evidence to really arrest them, I think there's an argument to be made they're more culpable than someone who comes on the scene later, takes a look at him and doesn't take action, and one of the officers who initially arrested him not charged with manslaughter. STEPHANOPOULOS: Let me bring this to Ray Kelly. These charges are often more likely to stick if officers turn on each other; but that's very rare. RAY KELLY, FORMER NYPD COMMISSIONER: It is rare. It's unlikely. They see it as not necessarily in their advantage. Now maybe an argument can be made for one or two of them in this case. My sense is that is not going to -- is not going to happen. The case is perceived as being weak and I think you're not going to see that much going on. STEPHANOPOULOS: You think it's a weak case across the board? KELLY: I think that's the general view of the case, certainly by the law enforcement people that I've spoken to. STEPHANOPOULOS: How about the more general issue of these police departments and the need for reform? You were on just a few weeks ago after that South Carolina shooting, said you turned around body cameras. What are police departments going to have to do to get the trust back in these communities? KELLY: There's a lot of soul-searching going on now by chiefs throughout the country. I believe that the police are more professional, educated, better trained, more restrained and more diverse than ever. These events totally could turn that around. We've made great progress in the last two decades. But you're really starting from scratch in a lot of places. I also believe that cameras will make a big difference. KELLY: They're going to help; they're not a panacea but moving in that direction, I think, will sort of increase the trust and comfort level over time. THOMAS: Yes, body cameras are increasingly being used by police departments. They know they have to show the public what they're doing. I also think that there's going to have to be more training and so the -- when to use excessive force. And I also think the police departments are going to have to take a look in the mirror and say they have to purge rogue officers, that these incidents, when shown on tape, are having a huge impact in terms of the perception of police. So they're going to have to deal with that. STEPHANOPOULOS: Brand new attorney general on the case, Loretta Lynch; President Obama had been out front on this. Expecting anything new from them? THOMAS: Well, the civil rights division is investigating this case in the parallel, a probe to see what happened. Also there's call -- there are calls for an investigation of the entire Baltimore police department. Also I think you will see the president continue to speak about this because the fundamental issue again is the pain and poverty in these communities. One of the statistics that struck me most about Baltimore this week, between 2010 and 2013, nearly 900 murders. Some years half of them weren't solved. You cannot continue to have people living in that kind of condition and expect anything other than what you're seeing. STEPHANOPOULOS: (INAUDIBLE) during this week 17 other shootings, even unrelated to the protests. I want to go now to Congressman Tim Scott of South Carolina, Republican of South Carolina. Thank you for joining us this morning, Senator. And you know, your own state has been rocked by the shooting of Walter Scott last month. Is it time now for a national response to these issues? SEN. TIM SCOTT (R), S.C.: I certainly think that law enforcement is a local issue but the question is can we weigh in from the national level and provide some resources? I think body cameras lead us in the right direction. I say that because according to at least one study in 90 percent drop in complaints against police officers and a 60 percent drop in the use of force. I think it helps the officer do their jobs better and keeps the officer safe at the same time helps to keep the community safe as well. So I think a part of the national opportunity for us to provide resources is there. I'll be very careful for the federal level to start figuring out how to have a local police, local policing. STEPHANOPOULOS: So we just heard Congressman Cummings talk about an inclusion revolution, more federal investment in cities. Ready to sign on for something like that? SCOTT: Well, I would tell you that I've been working for the last three years on the opportunity agenda, certainly folks is first and foremost on the power of education. I was once that kid that we're talking about drifting in the wrong direction, flunking out of high school. I found my way through the power of education. I found my way through the power of faith. And I will tell you that if we focus on first and foremost educational opportunities, if you look at the statistics surrounding educational achievement and the communities that are in most distress, what you'll find very clearly is that high levels of high school dropout, which leads to high levels of unemployment, which leads to even higher levels of hopelessness. So there is a trend that can be broken at its foundation if we focus first -- focus first on education. And then second on work skills. That second part of the opportunity (INAUDIBLE) been proposing for the last three years is the focus on apprenticeship programs, Cory Booker from New Jersey and I have created a bill on apprenticeship programs. You have to earn while you learn. We can provide hope and opportunity in communities throughout this country by helping folks get a better education, which may include school choice, charter schools, virtual schools and skills for the workforce. There is this growing middle skills need in the workforce where you need more than a high school education, less than a college degree and you reach the -- you can earn a very strong income providing resources and opportunities in a middle skill opportunity area. STEPHANOPOULOS: Finally, sir, you've also bipartisan calls for criminal justice reform, an end to mandatory minimums, more drug treatment instead of prison. Hillary Clinton called for an end of the era of mass incarceration. And this week can you sign onto that? SCOTT: Well, there -- I've been a part of the working group with everyone from Trey Gowdy to Bobby Scott in the House to Cory Booker and me, Lindsay Graham, Senator Durbin in the Senate. So we have been working for the last several months on different proposals. I am very interested and very engaged in studying the patterns of who we incarcerate, why we incarcerate and what we can do about it. So I think we're very open to it and frankly red state governors have done a fabulous job, according to folks on the Left on leading the way for criminal justice reform. STEPHANOPOULOS: Maybe some hope for breaking the gridlock. Senator, thanks very much for your time this morning. We'll be right back with reports from Las Vegas on last night's mega fight. Mayweather made history and hundreds of millions. But was it pro boxing's last hurrah? And the first challenger to Hillary Clinton is here. Senator Bernie Sanders standing by live. And we're back in just two minutes. STEPHANOPOULOS: In THIS WEEK's closer look, the mega fight. Mayweather wins the biggest purse ever. The whole world watching. But was all that excitement enough to save a sport on the ropes? T. J. HOLMES, ABC NEWS CORRESPONDENT (voice-over): It was dubbed the fight of the century. And Floyd Mayweather emerged the undisputed champion, taking the 12-round match in a unanimous decisions. Pacquiao, more popular with the crowd but couldn't equal Mayweather in the eyes of the judges. UNIDENTIFIED MALE: Manny Pacquiao is still a champion, you know, was the better man tonight. More calculated fighter. HOLMES (voice-over): But there was controversy, Pacquiao's camp revealing that shoulder injury kept him from training and he was denied an injection for treatment before the match. MANNY PACQUIAO, BOXER: Even though I hurt my shoulder, I didn't complain in the ring. HOLMES: The fight of the century is something boxing hasn't seen in years. A star-studded crowd. Seats selling for 300 grand online, and so many watching on Pay-per-View that cable systems crashed. And huge money was on the line. The fight estimated to bring in revenue of $400 million. Mayweather, known for his lavish lifestyle, engulfed by domestic violence charges, expected to take home upwards of $180 million for the win. But did the one-sided fight live up to the hype? Former heavyweight champ Mike Tyson tweeting after the match, "we waited 5 years for that?, #underwhelmed." UNIDENTIFIED MALE: He beat the man that everybody said he had to fight. He beat him convincingly. It wasn't even close. HOLMES: All of it coming as the sport of boxing faces its greatest challenge. With fans flocking to rival sports like mixed martial arts, a recent heavyweight bout featuring current champ Vladimir Klitschko couldn't even sell out Madison Square Garden. The heyday of champs who could make headlines, like Marciano, Ali, Tyson, decades in the past. And now with Mayweather announcing last night he may retire in September, is boxing's last best hope for revival down for the count? Or did last night's fight spark a comeback? For this week, TJ Holmes, ABC News, Las Vegas. STEPHANOPOULOS: Thanks to TJ for that. Joining us now from Las Vegas are ESPN colleagues Stephen A. Smith, Jeremy Schaap. Thank you both for joining us. I know you didn't get much sleep last night. And Stephen, I understand you just got off the phone with Floyd Mayweather? STEPHEN A. SMITH, ESPN: Yes, I did. He obviously is ecstatic that he won the fight. He was not surprised by it in the least. He thought he was going to win. He feels he's the superior fighter, and he feels like Manny Pacquiao is just throwing out excuses as to why he lost, instead of acknowledging what exactly happened, that the better fighter won. 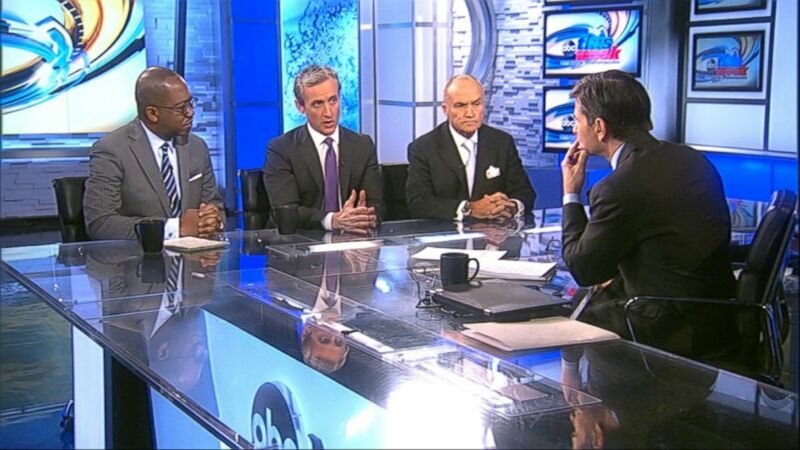 STEPHANOPOULOS: And Jeremy Schaap, we saw Mike Tyson underwhelmed. There has been a little controversy about that shoulder injury. You're laughing at Tyson? JEREMY SCHAAP, ESPN: I'm laughing at Mike Tyson. He has some nerve saying he's underwhelmed. I saw some pretty bad Mike Tyson fights over the years. Kevin McBride comes to mind immediately. STEPHANOPOULOS: And what's your take on the fight overall and that shoulder injury for Pacquiao? SCHAAP: It's exactly the fight, George, that we expected. A Floyd Mayweather win meant that it wasn't going to be a crowd pleasing fight. Floyd Mayweather is one of the greatest fighters ever. He's not a crowd pleaser. He's a masterful boxer. He clearly did enough to convince the judge that he won the fight, but it didn't make the fans that happy. STEPHANOPOULOS: And Stephen, what about it, what does this do for the sport of boxing? We see Floyd is likely to come back one more fight, hoping to retire undefeated as well. What happens to boxing after Mayweather leaves the scene? SMITH: Well, exactly what's happening to boxing whenever Mayweather is not fighting. The fact is, you've got a lot of quality fighters and a lot of quality boxers in the sport. Globally the sport is doing incredibly well. In America, that's an entirely different story, because we gravitate to the knockout, we gravitate to the heavyweight division. If you're a middle weight or a welter weight, you need to be somebody that has a lot of knockout power, because that's where the excitement of the sports really, really elevates. That doesn't necessarily exist right now, but you got Mexican fighters like Alvarez, Miguel Cotto. You look at the welter weight division, a guy like Keith Thurman is on the comeup. Gennady Golovkin in the middle weight division. He's a knockout artist. Andre Ward, an American fighter, (inaudible) out of Oakland, is the super middle weight champion of the world, has had some legal issues with promoters, that's been resolved. So now he's going to be back, and he and Gennady Golovkin could end up being a mega fight down the road. But something of this magnitude, no, we don't see that in the foreseeable future. STEPHANOPOULOS: But pretty bullish right there on the overall future of boxing. Jeremy, do you agree? SCHAAP: I would respectfully dissent from my esteemed colleague. I would say the problem - those are all great fighters, Stephen A. is talking about. They're fights that people who are boxing fans, aficionados, will care about. The mainstream sports fan is alienated from boxing. And events like last night's mega fight are the problem. It doesn't help. They get a few more people into the tent for the fight, for the few weeks building up to the fight, but you think the NFL would be more popular, George, if the Super Bowl cost $100 in your home to watch? Do you think the NBA would be more popular if you wanted to watch the playoffs, you had to pay $100 for a playoff package? That's not the way it works. The system we have in place means that all the wealth, all the attention accrues to the very top of the sport, but the grassroots have been dying out in this country for a long time. STEPHANOPOULOS: Jeremy Schaap, Stephen A. Smith, thanks very much. Up next, Hillary Clinton gets her first official challenger, senator, socialist folk singer, and he promises to shake up the Democratic primary. Bernie Sanders is here live in just two minutes. SEN. BERNIE SANDERS, I-VT: -- take a few questions, but we don't have an endless amount of time, I've got to get back. STEPHANOPOULOS: Bernie Sanders squeezed out some time this week to run for president. SANDERS: We're in this race to win. STEPHANOPOULOS: An unusual launch for a unique politician. SANDERS: I went walking that ribbon of highway. STEPHANOPOULOS: The folk singer from Brooklyn became the socialist mayor of Burlington, Vermont, back in 1981. Then took his populist message to the House. SANDERS: The rich have gotten away with murder. SANDERS: This is not a tax on the rich. This is a tax on the very, very, very rich. STEPHANOPOULOS: And now the longest-serving independent in Congress. SANDERS: I run vigorous campaigns. STEPHANOPOULOS: Is ready for Hillary. And Senator Bernie Sanders joins us now. Welcome to "This Week." Why are you the best choice for president of the United States? SANDERS: Because for the last 30 years, I've been standing up for the working families of this country, and I think I'm the only candidate who's prepared to take on the billionaire class, which now controls our economy, and increasingly controls the political life of this country. We need a political revolution in this country involving millions of people who are prepared to stand up and say, enough is enough, and I want to help lead that effort. SANDERS: It means that Hillary Clinton has been part of the political establishment for many, many years. I have known Hillary for some 25 years. I respect her and I like her, but I think what the American people are saying, George, is that at a time when 99 percent of all new income is going to the top 1 percent, and when the top 0.1 percent owns almost as much wealth as the bottom 90 percent, maybe it's time for a real political shakeup in this country and go beyond establishment politics. STEPHANOPOULOS: You are the longest serving independent in Congress, as I said, and when you announced Thursday, you said you'd remain an independent. But now you are prepared to file as a Democrat? SANDERS: No. In my heart, I am an independent. I have been an independent for 30 years. But I am seeking the Democratic Party nomination for President of the United States. And obviously I'm going to follow all of the rules and regulations to get on the ballot as a Democrat. STEPHANOPOULOS: Not going to run as an independent. STEPHANOPOULOS: You know, you said this campaign will be a clash of ideas. Which ideas? What are the biggest differences between you and Hillary Clinton? SANDERS: Well, I think it has a lot to do with our records. I think at a time when we have seen trillions of dollars shift from the middle class to the top one-tenth of 1 percent, we have got to say very frankly that the wealthiest people in this country and the largest corporations are going to have to start paying their fair share of taxes; profitable corporations can't stash their money in the Cayman Islands and avoid about $100 billion a year in taxes. That's my view. In terms of climate change, I believe this is the great global environment crisis of our time. I think we need extremely bold leadership. I have been leading the effort against the Keystone Pipeline. In terms of trade, I believe that the trade agreements we've had from way back, NAFTA, CAFTA, permanent normal trade relations with China, have been a disaster. I voted against them. I'm hoping to lead the effort against the Trans-Pacific Partnership so that we do not continue to see shutdowns of factories in America and the loss of millions of decent paying jobs. STEPHANOPOULOS: Hillary Clinton hasn't taken a final stand on that yet. STEPHANOPOULOS: And let me ask you also, you sold -- you told my colleague, Jon Karl, this week you have some concerns about the money raised by The Clinton Foundation. What are those concerns exactly? SANDERS: Well, it's not just The Clinton Foundation. Here are my concerns, George, and it should be the concern of every American. And this is, in a sense, what my campaign is about -- can somebody who is not a billionaire who stands for working families actually win an election in which billionaires are pouring hundreds of millions of dollars into the election? It's not just Hillary. It is the Koch Brothers. It is Sheldon Adelson. SANDERS: What I am saying is that I get very frightened about the future of American democracy when this become a battle between billionaires. I believe in one person, one vote; I believe we need a constitutional amendment to overturn Citizens United. And let me say this: on our first day, first day that we were out, we asked people to get involved in our campaign, 100,000 people signed up; 35,000 people made donations to berniesanders.com and we raised on that first day $1.5 million -- and you know what the average contribution was? STEPHANOPOULOS: Let's talk about a Sanders administration. What would it look like? You voted against both Obama Treasury Secretary nominees, both Jack Lew and Tim Geithner. Name a couple people you would consider for Treasury Secretary. SANDERS: Robert Reich is somebody who I have -- who was, in fact, the Secretary of Labor -- you know Robert. I think he has been a strong progressive and understands that what we need are economic policies that benefit working families, not the big money. You're right. I voted against these guys and I led the effort when I was in the House against the deregulation of Wall Street. I knew then that would be a disaster and it turned out unfortunately that I was right. STEPHANOPOULOS: How about Secretary of Defense? SANDERS: Now, a little bit premature. STEPHANOPOULOS: Premature? You're not ready to do that yet? STEPHANOPOULOS: Let me ask you, the presidential campaigns are famously actually the souls of a candidate, every part of your life is going to get scrutinized. So let's do a shortcut. What's the most surprising thing people are going to learn about Bernie Sanders over the course of the next year? SANDERS: I think Bernie Sanders is the proud grandfather of seven beautiful kids, grandchildren, four kids, married for almost 30 years. I grew up in a low-income, low middle class income family in Brooklyn, New York, 3.5-room rent controlled apartment. And growing up without a whole lot of money, George, that has been, I think, the most significant educational factor, if you like, in my life. I know what it's like to live in a family without a lot of money. STEPHANOPOULOS: Most people don't believe you can actually become President of the United States. Are you worried at all that your race might weaken Hillary Clinton without helping yourself? SANDERS: Well, let me just say this about my political career. I think few would argue that it is the most unusual political career in the United States Senate. Nobody thought that I would be elected mayor of Burlington, Vermont. Very few people thought that I would beat an incumbent Republican to become United States congressman from Vermont by 16 points. And people weren't so sure I could beat the richest person in Vermont to become a United States senator. So I would say don't underestimate me. STEPHANOPOULOS: Bernie Sanders, thanks very much. STEPHANOPOULOS: And coming up, the roundtable weighs in on Bernie Sanders. What it means for Hillary's campaign and we're going to be right back with the latest on Bridgegate. Federal prosecutors clear Chris Christie but can a former aide make good on his threat? STEPHANOPOULOS: And we'll be right back with all the latest on those indictments in the Bridgegate traffic scandal. Do they clear the way for Chris Christie or strike a final blow to his White House hopes? STEPHANOPOULOS: More than two years after those traffic jams engineered by aides to Governor Chris Christie, federal prosecutors lowered the boom on Friday, charging three with serious crimes. They spared the governor, revealing no evidence he knew about the crimes. But is that enough to revive Christie's White House dreams? Jon Karl brings us that story. JON KARL, ABC NEWS CORRESPONDENT: It was the traffic jam that stopped Chris Christie's political rise in its tracks. UNIDENTIFIED FEMALE: Ten-Four, we're getting calls from irate motorists. KARL: Now those lane closures off the George Washington Bridge have resulted in criminal charges for some of Chris Christie's one-time closest political confidantes. David Wildstein who has known Christie since high school, pleading guilty to conspiracy. UNIDENTIFIED MALE: He and others orchestrated a deliberate and illegal scheme to punish Mark Sokolich, the mayor of Fort Lee, for not endorsing Governor Christie's reelection. KARL: Wildstein claims he engineered the lane closures with two others in Christie's inner circle, Bill Baroni, a powerful political appointee, and Christie's former deputy chief of staff Bridget Anne Kelly. Both have pleaded not guilty. BRIDGET ANNE KELLY, FRM. DEPUTY CHIEF OF STAFF TO GOV. CHRISTIE: David Wildstein is a liar. KARL: And nowhere in Friday's indictments is Christie himself even alleged to have known about the plot. UNIDENTIFIED MALE: Based on the evidence that is currently available to us, we're not going to charge anybody else in this scheme. KARL: Christie took that as total exoneration, tweeting the charges, quote, "make clear that what I've said from day one is true. I had no knowledge or involvement in the planning or execution of this act." Still, the controversy has been a serious blow to Christie who was once considered a leading presidential contender. A fiery Christie first joked about the traffic mess. CHRIS CHRISTIE, GOVERNOR OF NEW JERSEY: I worked the cones actually. KARL: Then he admitted he was embarrassed by the alleged actions of his inner circle. CHRISTIE: I am stunned by the abject stupidity. And I knew nothing about this. KARL: But Bridget Anne Kelly hinted there may be more to come. KELLY: To suggest that I was the only person in the governor's office who was aware of the George Washington Bridge issue is ludicrous. KARL: And if Christie runs, all of this will play out in a trial just as his presidential campaign is getting underway. This Week, Jonathan Karl, ABC News, Washington. STEPHANOPOULOS: Thanks to Jon for that. We're joined now by the man whose original investigation sparked the federal prosecution. The number two Democrat in the New Jersey assembly, John Wisniewski. Thank you for joining us this morning. You just heard the U.S. attorney is planning no further indictments, produced no evidence that Governor Christie ordered or even knew about the crime. Do you accept that conclusion? JOHN WISNIEWSKI, (D) NEW JERSEY STATE REPRESENTATIVE: It's hard to believe that the governor -- I certainly have a hard time believing the governor -- when his key appointees knew about this, that he had absolutely no knowledge. STEPHANOPOULOS: But there's no evidence. WISNIEWSKI: You heard Bridget Kelly yesterday say that others in the governor's office knew. You heard David Wildstein the other day say that the governor knew. And so there are at least three different versions of the facts that are out there. One where David Wildstein says the governor knew, Bridget Kelly say folks in the governor's office knew, there's the master report, which has an entirely different version. And Bill Baroni still claiming that this was still the traffic study. STEPHANOPOULOS: Yet, the federal prosecutors look at this for over a year. You've been investigating for over a year as well. Have you found any evidence the governor knew? WISNIEWSKI: There's no direct evidence that the governor knew, but the governor is talking about this as if what happened on Friday was a vindication that he had no involvement. And Mr. Fishman said even in that press conference that this does not implicate or exonerate him. It had absolutely no specific findings for him. STEPHANOPOULOS: But the governor tweeted out on Friday, "the moment I first learned of this unacceptable behavior I took action firing staff believed to be accountable." Isn't that exactly what a governor is supposed to do? WISNIEWSKI: Absolutely. He's supposed to fire the people who are accountable. But we don't have all the answers yet. I mean, is this the new low in American politics is that at least I wasn't indicted. That seems to be a pretty low standard, because the governor appointed these people to high positions within his administration. One of them plead guilty, two of them have been indicted. STEPHANOPOULOS: But as you say, there's not direct evidence -- you don't have any direct evidence. He knew about it. You say there is more to come from your committee. What more can you do that the U.S. attorney didn't? WISNIEWSKI: Well, we still have our legislative inquiry. Remember, what the U.S. attorney did was a criminal investigation to see if laws were broken and whether prosecution should followed. That's not the role of the legislature. Our rule is one of oversight, but figuring out how to fix this problem. What do we need to do to reform the Port Authority. It's a huge agency. Most people don't appreciate that it's bigger than 26 states. It wastes a lot of money. This all came out of the Port Authority. We need to understand who gave the order to Bridget Kelly to do this so that we could stop it from happening again. So, for our committee, there's an entirely different agenda than the U.S. attorney's office. STEPHANOPOULOS: OK, John Wisniewski, thanks very much. STEPHANOPOULOS: We'll be right back with our roundtable here to weigh in on all the week's politics. HILLARY CLINTON, DEMOCRATIC PRESIDENTIAL CANDIDATE: It's time to end the era of mass incarceration. We need a true national debate about how to reduce our prison population while keeping our communities safe. SEN. TED CRUZ, (R) TEXAS: Do we criminal justice reforms? Absolutely. UNIDENTIFIED MALE: There's a lot of pain, and a lot of anger in our country because of a number of things. It's been building for a long time. UNIDENTIFIED MALE: It is not acceptable to have these divisions between our friends in the African American community and law enforcement. UNIDENTIFIED MALE: This idea of looking at everything through the prism of race I think is damaging to our country. STEPHANOPOULOS: And let's talk about this now on the roundtable. We're joined by Bill Kristol, editor of The Weekly Standard, Katrina Vanden Heuvel, editor and publisher of The Nation, Dana Perino, former press secretary for George W. Bush now with Fox and author of the new book "And the Good News Is: Lessons and Advice from the Bright Side," and Bill Richardson, a Democrat who served as UN ambassador, secretary of energy, governor of New Mexico, welcome to all of you. Let's begin with this pretty remarkable week in Baltimore. Bill Kristol, you heard Congressman Cummings at the top of the show say he thought Baltimore came out pretty well by the end of the week. Your take? BILL KRISTOL, THE WEEKLY STANDARD: I hope they come out better, but it's been a city that's had an awful lot of trouble over the last few decades. And I'm just struck by the contrast to New York. You know, New York instituted broken windows policing. I think there were 2,300 murders in New York in 1990, 333 last year. I mean, that's a pretty amazing drop. New York is now safer than America on the average. It was three times more dangerous in terms of homicides 20 years ago. I think you need to have tough policing. Obviously, policemen should be held accountable when they do something wrong, but we cannot abandon tough policing and law and order. STEPHANOPOULOS: Baltimore all said tough policing under -- Governor O'Malley, Mayor O'Malley then. KRISTOL: And crime went down a little bit during his term. KATRINA VANDEN HEUVEL, THE NATION: Let's hope that someone like Marilyn Mosby of Baltimore signals the future -- no justice, no peace. She's speaking to communities, which have through abusive discriminatory policing, communities of color been targeted. And what we're seeing now is a history of context, George, so that I think it's about egregious policing, according to the ACLU 109 people were -- died in police custody since 2010. But it's also about the need, if it's possible, for a national urban agenda, because these communities are also trapped in a prison of inequality, of despair, of joblessness. I think we have a trans-partisan moment where people won't channel their inner Nixon, but will channel ideas about new kinds of policing and end to mass incarceration. STEPHANOPOULOS: Because it does seem, Dana Perino, that there does seem to be -- we heard Senator Tim Scott, we saw those presidential candidates right there, there does seem to be some kind of a consensus forming about reform of the criminal justice system. DANA PERINO, FRM. PRESS SECRETARY FOR GEORGE W. BUSH: Yeah, and this has been building. It's across the board. When you have Rand Paul, Hillary Clinton, Cory Booker and Tim Scott, everybody on the same page, it seems to me that if they think it is this much of a problem that we shouldn't wait until the presidential election after 2016 to address it. If there is momentum, why don't they do it? But this is where I think the rubber hits the road is what are the details? What kind of crimes are they going to allow people walk away from? Is it gun possession? I mean, gun possession has a lot to do with this. Is the left going to be OK with illegal gun possession, those crimes being reduced? Maybe so. Maybe that's appropriate. STEPHANOPOULOS: You know, there's a lot of agreement at the issue of generality. I think Dana is right, will they actually get something done. BILL RICHARDSON, FRM. GOVERNOR OF NEW MEXICO: I believe so. I think criminal justice is going to be a big issue in the presidential campaign. And what we're talking about -- I mean, I was a governor and then congressman in the Bill Clinton years. And the thing to do was tougher penalties on drug offenders, mandatory minimum sentences, mass incarceration, build more prisons. I mean, that doesn't seem to have worked. And I think what you're going to see is candidates talking about ways that we have not necessarily fewer prisons but job training. I think there's going to be more talk about income inequality. That's going to be a big issue, poverty, inner city education. I think one of the big problems, George, we have in the inner cities is these kids, these young kids need to get stronger schools and more education. STEPHANOPOULOS: You don't think he can win? VANDEN HEUVEL: There are formidable obstacles. But his message is in synch with the populist moment we are in. And I think his message that he wants to fulfill the promise of America, that this is not a country that is going to be defined by billionaires, but lift up ordinary Americans, deal with staggering income inequality, the climate crisis, give people good jobs, not be held to corporate defined trade deals, Bernie Sanders, who announced to the nation a year ago that he would consider running for president, let's give him a chance. And the mainstream media might well trivialize and distort or others. But let's give Bernie a chance. KRISTOL: I think it is a populist moment. But I think incidentally on crime, the populist answer is to lock up criminals. Bill Clinton was right. Disappointed to see Bill Richardson, who served him so loyally, now abandoning Bill Clinton's message as the Democratic Party as a whole has abandoned Bill Clinton's centrism. I think it is, though, a populist moment in the sense that people, middle class working class Americans would like to see policies that help them more. But so fine. Let's have school -- I mean, the single best thing what to do for poor kids in Baltimore or anywhere else is have more choice of schools, more competition among schools. In New York there are terrific charter schools attempts, which Bill de Blasio, this hero of the Left, is trying to shut down. There have been much attempts to introduce charter schools of competition, break up the teacher unions stranglehold in Baltimore, I don't think so. Will any Democrat run as a school reformer the way Bill Clinton did? This year? I'm doubtful. RICHARDSON: I just think there has to be a balance. And clearly I think we went too heavy on the march, mass incarceration. But look -- and I think the police have taken a bad rap and -- but it's clear. I mean, we need more training of our police, more diversity in the police forces. We need more -- like in Baltimore, they should have been more reactive. They should have moved faster. VANDEN HEUVEL: It's not even Bill Clinton. There are thoughtful Republicans for laying out alternatives as Dana suggested. This is a moment for real solutions and not just calling for tough policing, which we've seen blow up in cities, epidemic after epidemic, in these last months. VANDEN HEUVEL: There's a balance. STEPHANOPOULOS: (inaudible), also rethinking trade, not only crime, and we just talked to Bernie Sanders about that issue coming up, President Obama trying very hard to get it passed. Hillary Clinton not ready to declare where she stands. PERINO: I think this is actually one of the biggest stories of the week, even though some of my colleagues didn't agree with me because there's other bigger news. But this debate within the Democrats about trade, to me, is fascinating. You hardly had any of the moderate Democrats of like so the 1990s, 2000s Left. You had them rethinking their positions. And you have President Obama, who has not had any deep relations with anybody in Congress now having to struggle. And is probably going to lose on the Democratic side this trade fight. STEPHANOPOULOS: So you think it's going to go down? PERINO: I would -- I think that there's a real possibility that this trade bill does not get passed. RICHARDSON: -- on NAFTA. I was one of the very few that supported it when President Clinton proposed it. But it started building -- I think Dana's right. Democrats are the majority will probably reject it. But trade authority will pass with Republicans. STEPHANOPOULOS: President Obama is saying he's already put that in. VANDEN HEUVEL: But what Bill is saying is you know the trade unions and Democrats aren't against fair trade and globalization. But these trade rules are being written by corporations and banks. It speaks to what Bernie Sanders when -- at his best, he talks about the rigged rules that have been written for the few, for the few. We can do better. STEPHANOPOULOS: You bring the (INAUDIBLE) Chris -- before we go, I want to talk about Chris Christie and those indictments that came down on Friday. He says still full speed ahead, going back up to New Hampshire. KRISTOL: He has someone speaking in Washington. And he's planning to go to New Hampshire, have a million town halls and try to make his case. Some chance, but this is such a wide open Republican field this year, it's not your typical Republican race. The Democrats are having Republican race with the (INAUDIBLE) front-runner. The Republicans are having the Democratic race with several I think very well qualified governors, senators, former governors and so forth. I think that's Christie's problem, though. There are plenty of impressive people already in the field. So it's not as if voters, Republican primary voters, are looking around and saying we need Chris Christie. STEPHANOPOULOS: And Dana Perino, this week alone, I mean, tomorrow you're going to have Ben Carson get in the race, Carly Fiorina is going to be on "GOOD MORNING, AMERICA", getting in the race tomorrow. Mike Huckabee on Wednesday, it's let 1,000 flowers bloom, huh? STEPHANOPOULOS: Walker's leading in Iowa and New Hampshire. VANDEN HEUVEL: -- budget cuts against higher ed and working -- this assault on working people, not popular. RICHARDSON: You know, I was in the presidential race. I didn't last very long, So I don't have a lot of expertise, but I wouldn't count Christie out. I mean, it's so early, he's had a big blow with these indictments but I wouldn't -- I think Huckabee, he controls a large vote at the religious Right. I wouldn't discount him either. Obviously you know, I'm not an expert but I think Walker, Rubio have emerged; I still think that in the end the Republicans will see that their most viable candidate is Jeb Bush. And Hillary, Jeb Bush fight will be very interesting. And it could go either way. That's my prediction. STEPHANOPOULOS: We've got a long way to go, we're out of time though for today. Thank you all very much. And we'll be right back after this from our ABC stations. STEPHANOPOULOS: And now we honor our fellow Americans who served and sacrificed. In the month of April, two service members died overseas supporting operations in Afghanistan and Iraq. STEPHANOPOULOS: That is all for us today. Thanks for sharing part of your Sunday with us. Check out "WORLD NEWS TONIGHT" and I'll see you tomorrow on "GMA."